written by Jonathan Hickman and Nick Pitarra. Essentially this applies the anything-goes mad science approach of steampunk to World War 2. 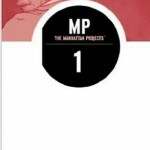 The premise is the Manhattan Project was not about developing just an atomic bomb, but also inter-dimensional portals, artificial intelligence and so on. Extensively features weird versions of real people, of perhaps too recent memory for that to be entirely comfortable. Interesting use of colour: many sequences are coloured solely in red and blue, for various purposes – to separate individual threads of dual-stranded flashbacks; to draw unsettling attention to specific objects (eg a red book in an otherwise all-blue setting) and to differentiate parrallel-world versions of particular characters.